Good Morning, Good Afternoon, Good Night!! 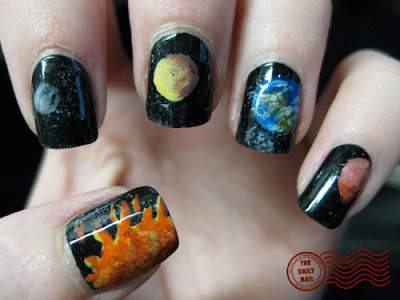 (depending on what time it is when you might read this :-P ) Today's nail design is out of this world...literally. (It's the solar system!) :-P I've had this on my list for some time, but only just now got around to doing it. (too many other fun ideas kept presenting themselves!) Oh well, it's done now, and YES, I included Pluto, because to me, it will always be a planet, scientists be damned. I think Earth and the comet on the pluto nail ended up being my favorite things about this mani. American Apparel Hassid as a base for all 10 nails, with American Apparel Cotton lightly sponged to make distant stars. American Apparel Manila as a base for the sun, with Electric Orange, Zoya Pinta and American Apparel Manila again sponged over it to give a fiery, mottled look. American Apparel Cotton mixed with American Apparel Hassid and a touch of Essie Mink Muffs, and shaded with the same combination with more American Apparel Hassid. American Apparel Cotton mixed with American Apparel Manila, the mixed that combination with American Apparel Pinto and a touch of American Apparel Hassid to shade. Pure Ice French Kiss as a base for Earth, highlighted with Pure Ice French Kiss mixed with a touch of Essie Mint Candy Apple, For the continents, I used L.A. Girl Army Green as a base, then mixed with American Apparel Hassid and Essie Mink Muffs to create some topography. For the clouds, I lightly brushed American Apparel Cotton. American Apparel Cotton mixed with American Apparel Pinto as a base, highlighted with the same mixture with a bit more American Apparel Cotton, and shaded with straight American Apparel Pinto. Essie Sag Harbor mixed with American Apparel Cotton, then added a little Pure Ice French Kiss to the mixture to add more of the bright blue color that Saturn's Northern Hemisphere is supposed to have. For the rings, I used American Apparel Cotton. Essie Sag Harbor mixed with Essie Mint Candy Apple for the planet, and American Apparel Cotton VERY lightly used to create the almost non-existent looking ring. Orly Gumdropas a base for the planet, then mixed with Pure Ice French Kiss for the outer shadow, and mixed with American Apparel Cotton for the highlight. For Pluto, I used American Apparel Manila mixed with a tiny bit of American Apparel Cotton, then dabbed a little Essie Mink Muffs and American Apparel Hassid on it. For the comet, I used American Apparel Manila and Electric Orange. Did you know that this past week the sun had it's most violent eruption in 15 years?! wow- those look amazing, how do you come up with those great designs? I LOVE that earth! It's so cute. absolutely incredible!! one of your best so far! oh my god!!! 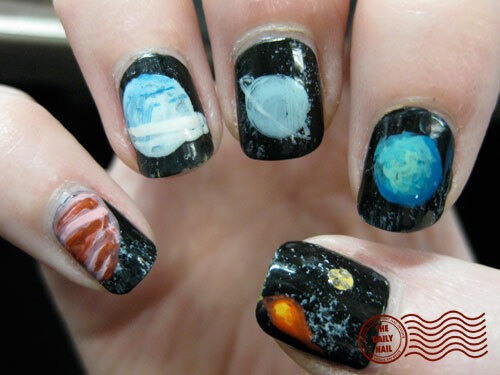 i literally JUST did my nails like the solar system on sunday. that is too weird! That is soooo cool! Is this free hand or stencil? Hi! I'm a new reader, and I have to say that this looks amazing. I'm also into nail art, but your designs intimidate me. Indeed, Pluto will always be a planet, and Brontosaurus will always be dinosaurs, even if apatosaurus came first. These are really impressive, very snazzy. WOW, u rock so much. Jeez. It is sooo well done. Huge fan. Freaking AMAZING!!!! Sending this one to my astronomer dad! This is definitely my favorite - although I loved Hitchcock nails, too. This is AWESOME! This could be my favorite one yet! So very glad you included Pluto! "That is the coolest thing I've ever seen." Then he said: "...and Jupiter makes me want bacon." We both think these rock. And paper. And scissors. These win all. I'm so happy you included Pluto. I can't believe you did all that hard work for one day?! I hope you showed them to everyone you met ~ they are awesome!!! wow...those are "out of this world" amazing! Wowwwwww!!! Each day I visit your blog I'm more excited! You are very creative... I love your nails...Put your link on my blog!!! Congratulations!!! Omgoodness. I thought those were stickers or photos or something - unbelievably realistic looking. Venus, Earth, and Pluto/Comet are my favorite. You're so freaking talented! Wow! Absolutely incredible! Fantastic job! I can't stop with the compliments!!! Simply amazing. I am speechless! These are some of my favorite yet little sis, Andy's as well!! Glad I can post comments now with the new internet. Great Job love it....was just thinking of doing this! Oh well, you beat me to it :). My astronomer dad was blown away - and he wants to know how long it took!